Go West – we’re off on vacation for several days; so, depending on cell data coverage the blog post may be a little intermittent. 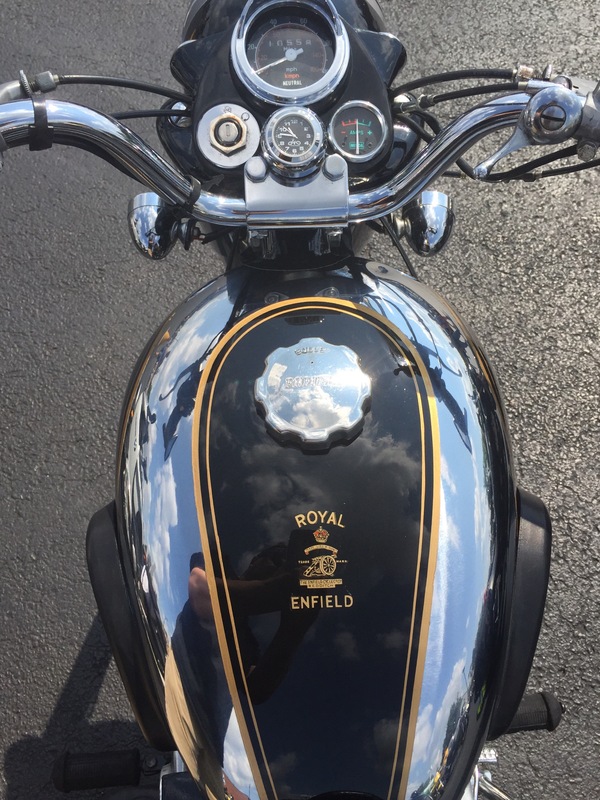 Today’s image is the oversized Indian head tank badge for the Enfield detailed motorcycle. Motoworks – open house down at Johnny Scheff’s excellent dealership. 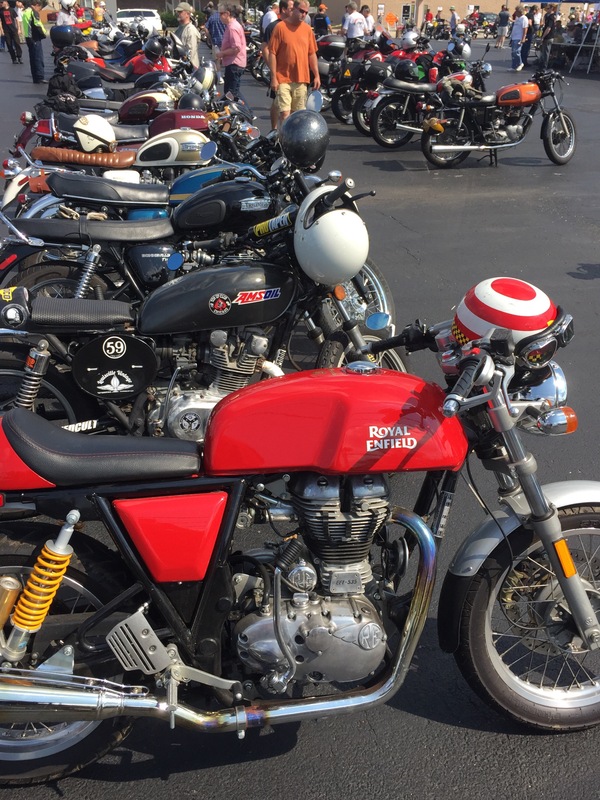 Triumph, Ducati, Royal Enfield and Vespa all represented. Service also caters for BMW. Sunny weather, burgers and good chat. The vintage license plate with 68 GIT was an old Bonnie. They say you should stare at something yellow for 30 seconds every morning to start your day off on a positive note. 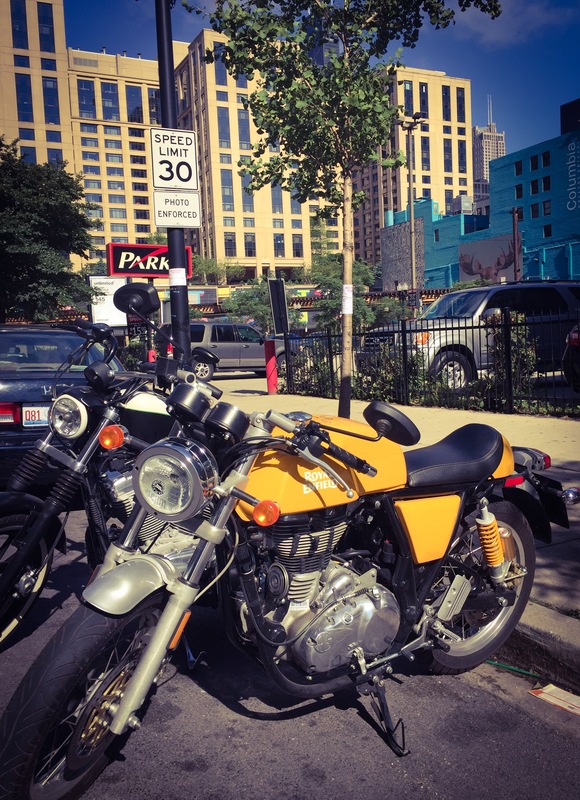 Well here’s a modern Royal Enfield parked in downtown Chicago. Over easy I’d say. Bikes etc. 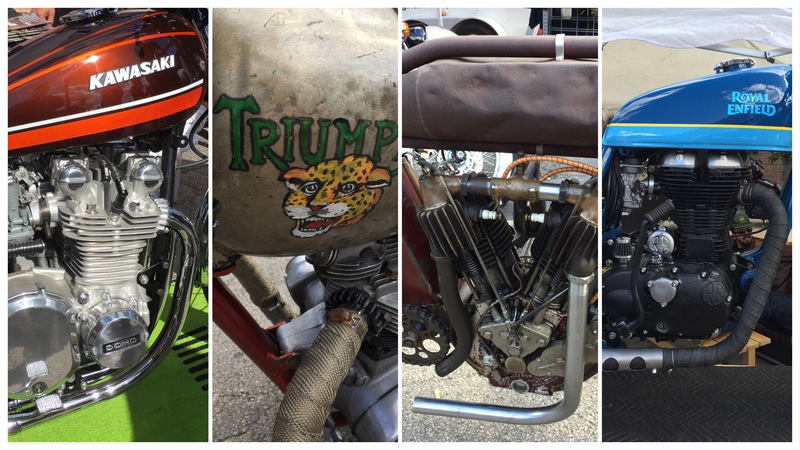 – the annual gathering of the ‘alternate’ motorcycle scene on Fulton Street was enjoyed with plenty to look at. Here’s a taster in a four panel collage. The Kawasaki KZ was in more-than immaculate condition. A bobbed Triumph in ratty patina had a fun tank badge and leopard motif. A 1912 Indian with oily rag wipe down appearance. 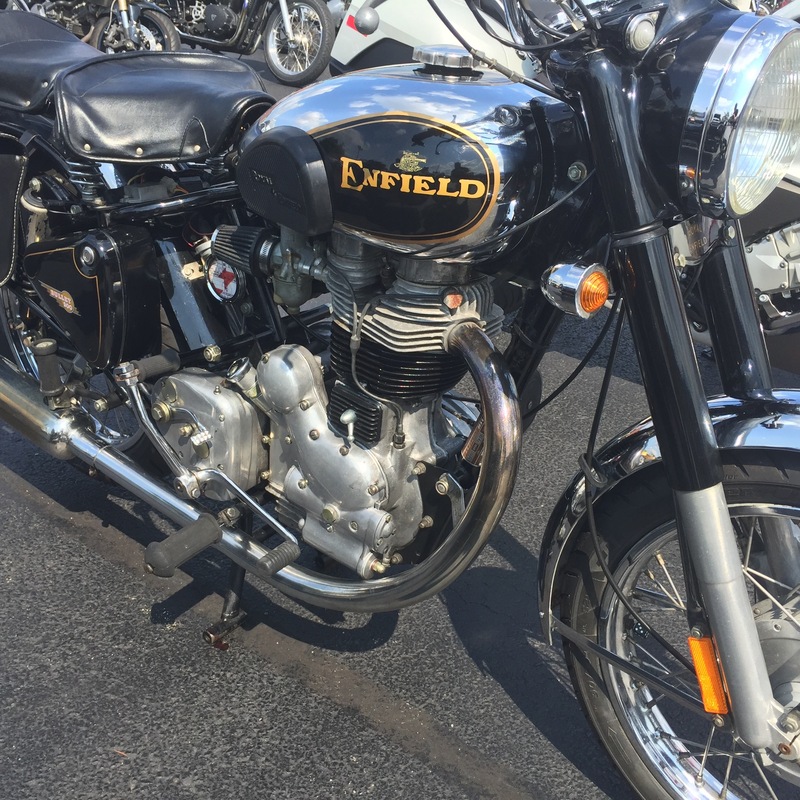 And a latter-day Royal Enfield looking the part for twisty secondary roads. More to come! 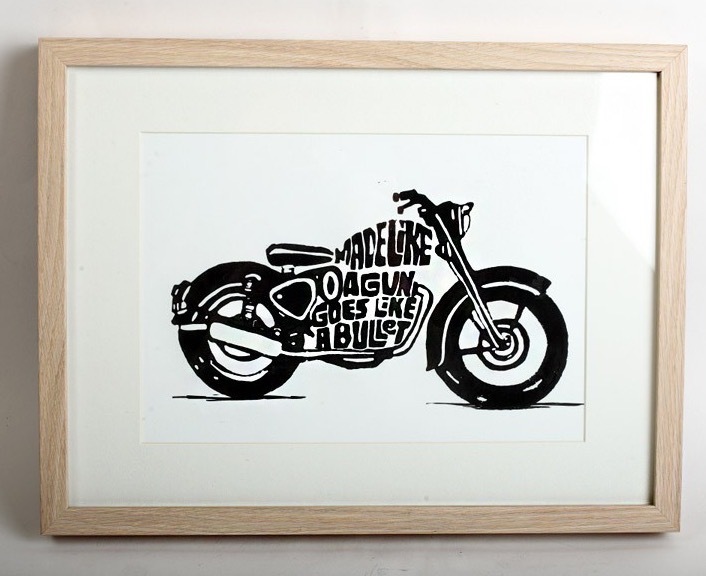 Built like a Gun – or so their advertising header says. Now from the sub-continent, these classic singles look like they hark from the fifties; but with modern day build. Some polished models with pinstripe details, others in olive drab military garb. The single-minded cafe racer Continental GT certainly looked that part too. All still have their kick-starts as standard too! Another rifle maker took their machining expertise to two wheels. 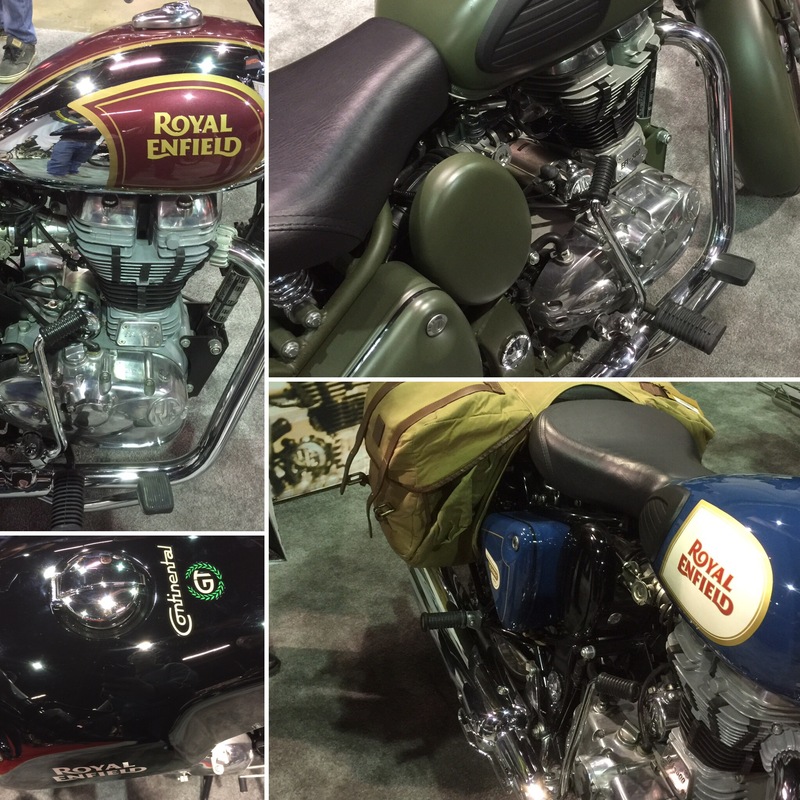 Royal Enfield. Their 500cc Bullet was a stout motorcycle during the fifties with its thumping single piston pounding away like a robe and mortar boarded teachers fist on a school desk. 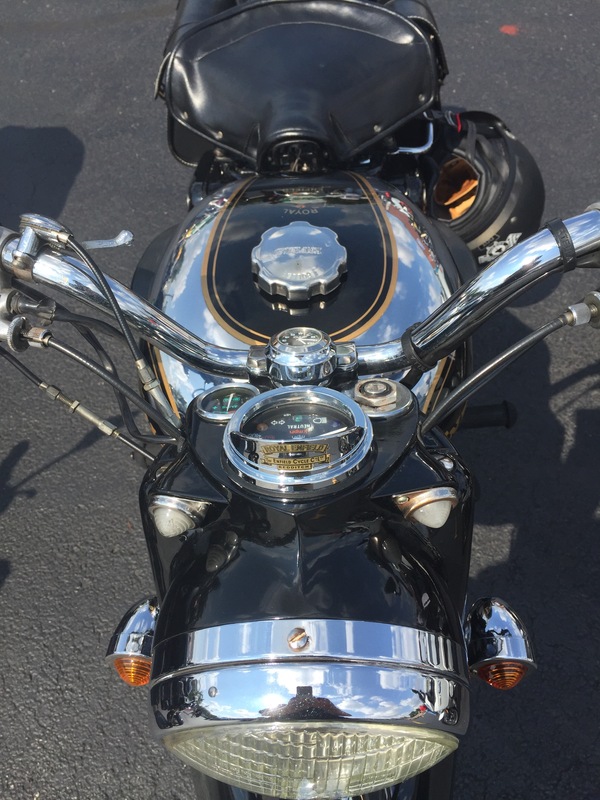 Chrome tank with ebony top panel and gold pin striping: quite special. The Redditch badge with cannon and crown give respected symbol. A super machine that pounded a hearty note when its owner kicked it into life and rumbled a Ay along St Charles Road through Villa Park. Parked nearby was the new Enfield GT Continental in rocket red. From what I hear it’s a smile inducing ride; though powered like an older machine, which won’t get you into license losing trouble. Hey! There’s my orange Bonnie in the background right!